Good morning! 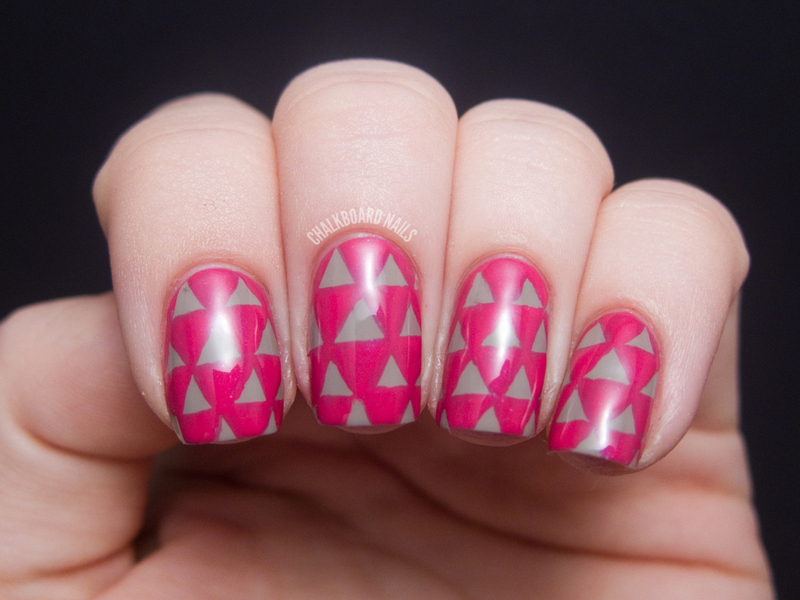 Today I have a cool geometric design to share with you guys. I have just been loving geometric patterns lately! I decided to translate that love to my nails. 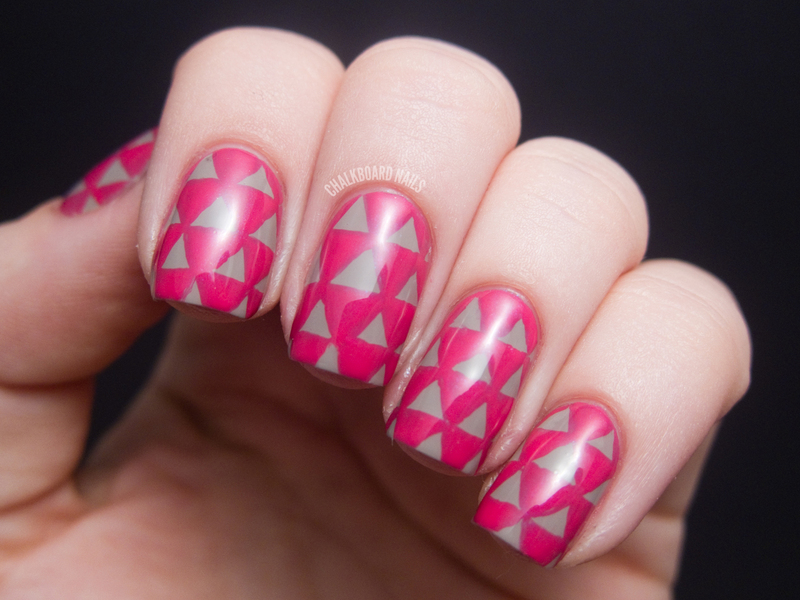 This triangle design was made using L'Oreal Colour Riche polishes. I've actually not used L'Oreal polishes before this but found myself pleasantly surprised! The base color is L'Oreal Eiffel for You. It's a nice neutral, kind of like a mushroomy warm grey. I used two coats for full opacity and the formula was really great. Very smooth and just the right consistency! 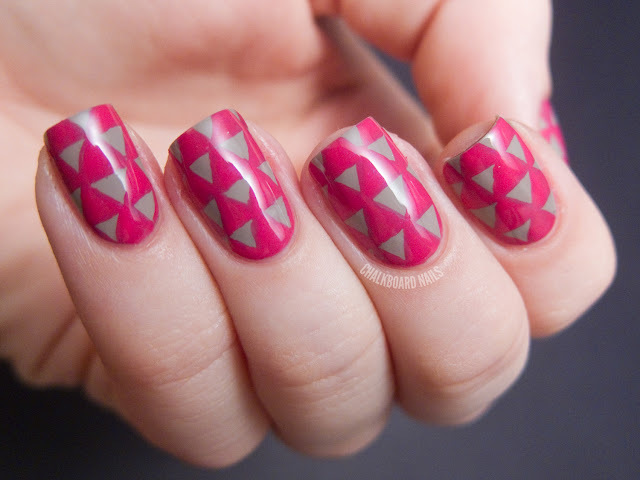 The triangles were freehanded on with L'Oreal Check Me Out, a hot pink with a slight shimmer. Unfortunately the shimmer didn't really translate to the nail as well as I'd have hoped, but it's still quite a nice color. It wasn't completely opaque for nail art, I had to go over the pattern one extra time for full opacity... That is definitely pretty standard though when doing nail art with polish instead of acrylic paint, so no big deal. I'll tell you what, this design took a lifetime and a half to finish! It was slow going because I was trying to make sure that my triangles looked as clean as possible. I used the same medium length striper brush I almost always use for nail art (I'm gonna try to do a "tools of the trade" post soon). I'm really happy with the results though, despite the time! 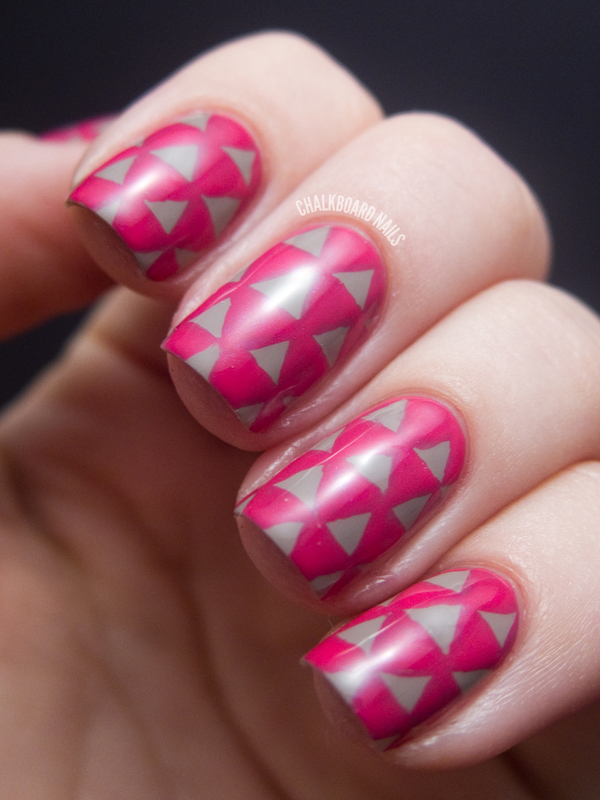 My original design idea for these polishes was to do a checkerboard print. Right when I was about to start painting, I thought, "Why not triangles, instead?" So I changed the design on the fly and think this turned out nicely. It's like a checkerboard print but with one less side, right? Three instead of four? 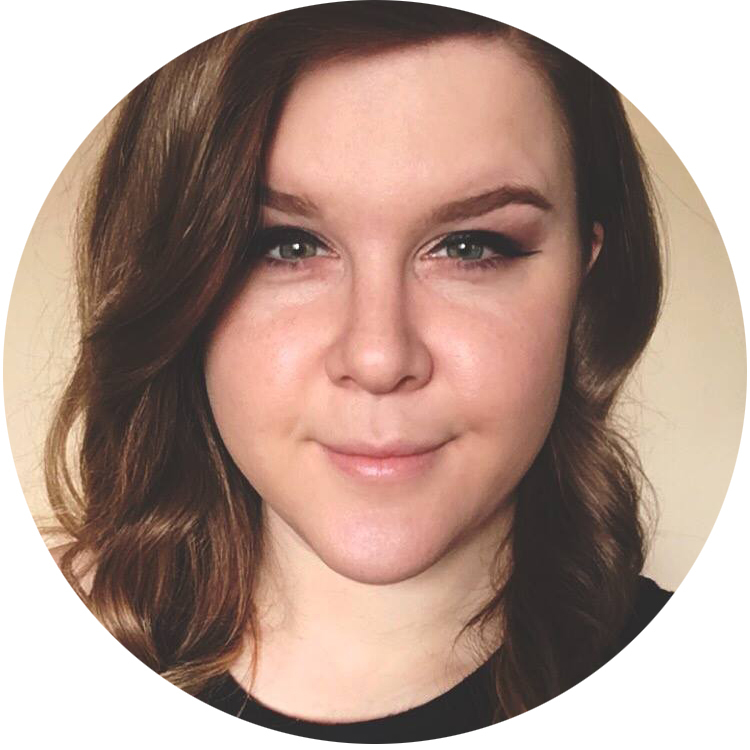 I was definitely pleased with my first time trying the Colour Riche line. I've got a couple more colors to share with you guys soon, so stay on the lookout for those. L'Oreal Paris Colour Riche polishes retail for $5.99, and are available at www.lorealparis.com, as well as a number of other chain drug, food and mass market retailers. The products in this post were sent to me by the manufacturer or their PR for review. Nice design! I've always wanted to try something like this. Cute! I like the pink on top of the neutral. wow! Very cool! You freehanded the triangles? wow! They look just so neat and perfect that I thought you stamped them. This looks great, I love it! I really dig that color combo. Muted neutral w/saturated bright looks fantastic! Looks great! You must have amazing patience! Looks great! Awesome that you did this freehanded! This turned out great!! You have great patience! These two colors are brilliant together, well done! Love this. It is so pretty. Very patient especially having to go over it twice. Just Beautiful. this is so cool! great design! Awesome design! It turned out great. whoaaaa trippy! i actually saw a pair of shorts i wanted in this design just the other day... i was so bummed they didn't have my size! and now, they're featured on your nails LOL! This is such a cool pattern! Kind of reminds me of something that you would see in an 80s/90s line of clothing. Lovely! I must say, these are colors I wouldn't have chosen for myself, but they're quite nice! Thanks for opening my eyes a bit ;). I'd love to see a tools of the trade post, as I'm a bit of a newbie to the craze. WOW! At first I was wondering how you'd place the tape to get this pattern and when I read that you free-handed it I was blown away! I love the idea of it and the color combination is very unique! I might just try this one day. If i can figure out how to do it with tape of course. Ooh triangles :D This looks awesome! This looks so cool! I'd never be able to get triangles as neat as that. I love those L'Oreal polishes- they pretty much all have great creme formulas. I swear by their navy color. Wow, this must have taken you forever!